It’s probably no surprise to hear that we’re big advocates for electronic document storage. We consider ourselves to be scanning and OCR specialists (so you don’t have to be! ), and we love being able to serve our clients with a 100% digital single stream solution for their invoices – regardless of what format the invoices arrive in. But the fact remains that physical paper storage of documents is still common – a little too common, if you ask us. In our recent webinar, “Ease Audit Panic with AP Automation,” Joe Zulich, manager of accounting operations at White-Rodgers, recounted the pain of digging through stacks of dusty boxes at their manufacturing plants to find a single invoice – not to mention, having to hope that invoice gets refiled back in its original place down the road. Third-party storage facilities presented their own problems to the White-Rodgers team, collecting fees for not just the storage of documents, but also fees for retrieval and refiling. And even then, they sometimes still weren’t able to find the documents they needed. “By the time you got the invoices back to file them, because maybe you had [another] audit coming up, who knows where those invoices were,” Joe explained in the webinar. “Back in those early days, we just wanted to be able to find an invoice when we needed an invoice. Money is the most obvious and tangible saving when it comes to electronic document storage, but when it comes to “the way we’ve always done it,” it’s not always the easiest to convince someone of. If you break down paper document storage into pieces, though, the fees add up fast. And don’t forget to include the costs of the paper, ink, and printers that go along with producing and keeping paper documents. Going paperless eliminates all of these fees. Sure, there will be some costs associated with electronic storage, but those fees end up being a lot more palatable when compared to the ever-growing fees associated with paper storage. For anyone who has spent time finding documents among hundreds of boxes and file cabinets, this is probably fairly apparent. In our webinar, Joe spent some time detailing why it’s not just important from the standpoint of lost employee productivity, but also from the standpoint of running smooth, efficient audits. He pointed out that auditors are only on-site for a few days, so they need electronic documents to review when they return to their office. That means that your employees not only lose time searching through file cabinets for the paper documents – or in the case of off-site storage, waiting for warehouse employees to find their boxes – but then they have to scan the paper document into a digital format and send it to the auditors. And don’t forget, your staff still has to keep track of the paper document and make sure it gets returned to its original location. Wouldn’t it just be easier – and faster – for all parties if the documents were stored electronically in the first place? Going paperless goes a long way when it comes to doing our part to protect the environment. According to the U.S. Environmental Protection Agency, the world produces more than 300 million tons of paper each year, and the types of paper often found in offices, such as copier paper and computer printouts, make up the largest category of paper consumption. With recent campaigns to reduce our plastic waste with fewer straws and grocery bags, it should come as no surprise that we also need to focus on reducing our paper waste to support a healthier environment. With digital documents, however, you can track electronically who has accessed the document, when and by whom the document was processed or approved, and when it is transferred to another system, like an ERP platform. Auditors can easily access this information, saving any worry that documents or invoices have fallen into the wrong hands along the way. Security is – and will remain – a big concern when it comes to both paper and electronic documents. Certainly, there are security pros and cons to both, but the risks that come with paper documents outweigh the risks associated with electronic documents. Electronic documents have an inherent vulnerability to hacks and data breaches, but paper documents are vulnerable to other types of physical catastrophic events, including theft, fire, water damage, and natural paper decomposition. Just like with the audit trail, it’s difficult to track who handles paper documents along the way, opening up risks for unauthorized access. Electronic documents have built-in digital records, and automation platforms like DataServ can provide secure, authorized access. It’s time to go paperless. 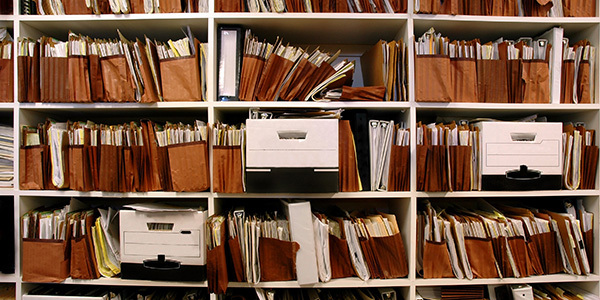 Are you ready to save your company from the costs of paper storage? Contact us.